Last month we wandered into the wonderful world of sourdough baking. We found what sourdough is and how it's made. Now it's time for Part Two. So let's bake some bread. Mix all ingredients together in large bowl with a wooden spoon, or use your big mixer if you have one. Mix until a stiff dough forms. Turn the dough out on a lightly floured surface and knead until it becomes elastic and loses its stickiness. Put the dough in a large oiled bowl, turn to oil the top, cover and set in a warm place until it doubles in bulk. (Setting the bowl in direct sunlight works real good.) The sourdough will rise a little slower than bread made with commercial yeast, so be patient. When the dough has doubled, punch it down and knead a few strokes. Place it on a cookie sheet for a round loaf or use bread pan if you prefer. If you use the cookie sheet, sprinkle a little cornmeal on it so the bread doesn't stick. Spray the top of the bread with Pam or brush it with oil so your cover doesn't stick. Cover and let rise in warm place until doubled again. With this bread, you start with a cold oven. Put the bread in the oven and set it to 375F degrees. This gives the bread a little more rising time as the oven comes up to temperature. The bread should be done in 30 to 45 minutes. When you tap on it and it sounds hollow, it's done. Turn it out of the pan and brush all over with melted butter or oil. Put it on a rack and let it cool at least an hour before you tear into it. Here's the biscuit recipe from our visiting expert. You can tell by the detail in the recipe that John has put a lot of time and research into his biscuit recipe. He gives amounts in both volume and weight. He prefers to weigh the ingredients, but most kitchens are not equipped to do such delicate measurements. Eight to twelve hours before the biscuits are to be baked, prepare the sponge. Cover it with plastic wrap and allow it to stand in a warm place until bubbly and frothy. Note: Although whole milk may be used, the exact volume and composition of the recipe is best adhered to if the designated amount of water and powdered milk is used to make up the quantity of milk required. Combine all the dry ingredients except the baking soda in a mixing bowl. Cut the shortening into the mixture until it is about pea sized. Dissolve the baking soda in about one tablespoon warm water, and stir it into the sponge. The sponge will become frothier. Add the dry ingredients containing the shortening all at once to the sponge and stir. Remove the mixture to a floured board and lightly knead until it forms a smooth, cohesive mass. Pat out the dough to a thickness of about one inch and, using a biscuit cutter, cut it into rounds. Take care not to twist the cutter. Crowd the rounds into a well-greased 9x13-inch pan, and spray the tops with Pam. Cover the pan with plastic wrap and allow to rise in a warm place or at room temperature until they are approximately doubled in bulk. Do not become impatient since this step, based on room temperature, can take up to 3 hours. Preheat the oven to 375F degrees, remove the plastic wrap and place the pan on the oven middle rack. Bake for 30 to 35 minutes. Remove the biscuits from the pan and serve hot. John included some additional information learned from his years of baking experience. My starter was originally developed from commercial yeast that later became sour by incursion of wild yeast spores from the air. It took me several days to establish the starter and if you think it useful I could go back into my records and outline the method for you. Frankly, I do not believe development of my starter is much different in principle from making any other active sourdough starter. The literature is filled with directions for making sourdough starters and any aspiring sourdough baker can certainly access these instructions. Basically, my starter consists of trapped wild yeast, flour and water. The ratios of water to flour are one-third water by volume and two-thirds flour by volume. On a weight basis, the ratios become 50 percent water and 50 percent flour. These ratios are important because my recipes use them when developing the flour and liquid portions of ingredients in recipes. Other starters are more liquid than mine and commonly have the ratio of 50 percent by volume water and 50 percent by volume flour. Convert these starters to an equivalent of my starter by adding to each one cup of the liquid starter one-half cup flour. The resulting starter will be thicker in consistency and must be allowed to stand several hours to allow the added flour to be acted upon. When I decide to make sourdough biscuits, or any other sourdough recipe, in the early afternoon I remove the stored sourdough starter from the refrigerator and set it on the counter top. Along towards early evening after the starter has reached room temperature, I stir 1/3 cup water and 2/3 cup flour into the sourdough base, mix it thoroughly, replace the container cover and allow the mixture to stand overnight on the counter top. In the morning, the starter will have become very active, full of bubbles, and give off a characteristic sour odor. It is now expanded in volume, fully active and ready for use in baking any sourdough recipe you may choose. 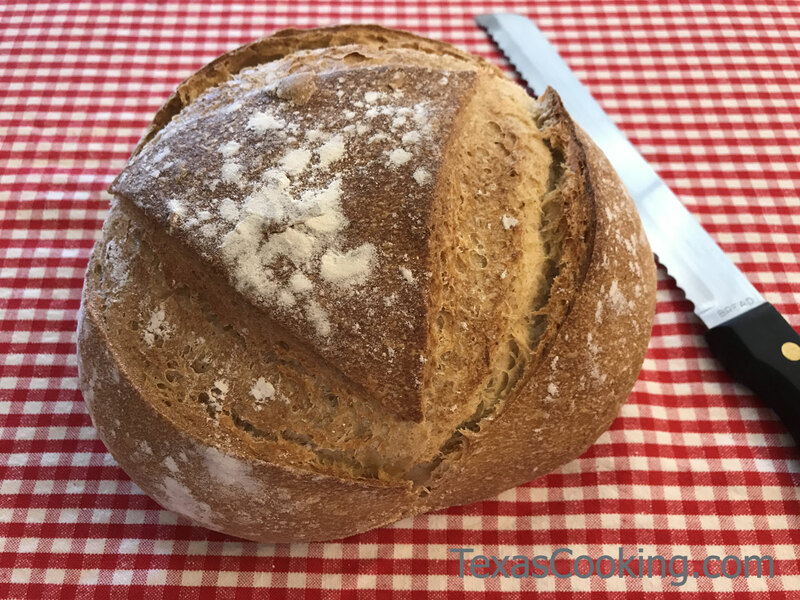 Sourdough baking can only be successful with a lively and active starter combined with patience on the part of the baker. We have just about run out of space for this month. Tune in next month for more recipes and some words from a Dutch oven baking professional.